The snow is still falling and hoops and hockey are on the minds of most Michigan fans these days, but as we all know...it's never too early to start thinking football. After all, spring practice starts in just a couple of weeks. The 2013 season was an up and down year for the Michigan defense. They finished the season ranked 41st in the nation overall, 29th in rushing defense, 51st in pass efficiency defense and a pretty unimpressive 66th in scoring defense. While much of the struggles of the 2013 season have been blamed on the offense (i.e. : Al Borges), the defense wasn't without fault at times. Allowing Akron and UConn to stay alive in those two games, giving up 47 points to Indiana and barely showing up against Ohio State and Kansas State. All in all, 2013 is a season that the defense would like to forget just as much as the offense. There are some holes to fill for 2014, but all things considered, not that drastic. Up front, Quinton Washington and Jibreel Black are gone, Cam Gordon at LB, safety Thomas Gordon and cornerback Country Avery. Its not the end of the world, but those are some names that turned out to be key contributors. But as we all know, this defense is young and deep and full of potential. With the departure of Qwash and Black, the emphasis of adding some bulk and production in the middle is critical for Michigan this season. Pipkins is rehabbing from his torn ACL last October, and ideally will be back and ready to go by this summer. He as well as Henry and Hurst should all compete for the nose spot. Heitzman, Wormley, Charlton, Clark, Ojemudia, Beyer and Godin will all probably see good playing time. Not a bad two-deep if you ask me. Mattison likes to sub in and out frequently, so a rotation of a lot of these bodies should be expected. One thing I'm also expecting is more size on a lot of these guys, especially Wormley and Beyer. They're going to need it. Michigan finished 2013 with just 25 sacks, good for 66th nationally. That's not going to cut it. Michigan gets a lot of it's pass rush from blitzes, but a healthy, consistent 4-man rush would be a nice addition to the defense for this year. 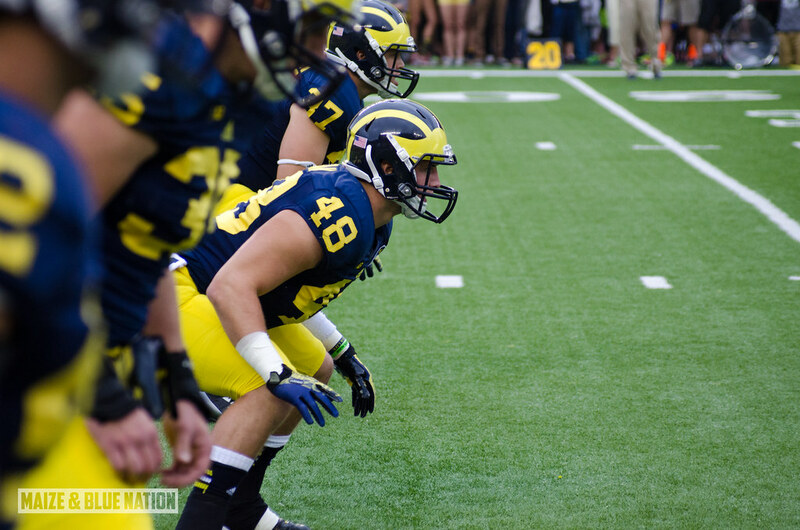 As a group, this should be as good of a year as Michigan has seen at linebacker in quite some time. The loss of Gordon should have minimal impact as lots of veterans and experience return. A fully recovered Jake Ryan, as well as Desmond Morgan, James Ross are the veteran starters. Joe Bolden also in the mix at MLB. The key for this group, other than providing the much needed pass rush when its dialed up, is to avoid being torched by mostly spread-style offenses...Ohio State, Northwestern, K-State, Indiana all did a number on this group. There are a lot of "ifs" when you're talking about Michigan's linebacking corps, but it mostly just boils down to staying aware of what's happening around them in zone coverage and not beating themselves by finding out too late that they're wildly out of position. IF this crew can shore up in that area, they could be magnificent. Is Jabrill Peppers truly a program-changer? Can he be Woodson-esque? Maybe. Probably not so much as a true-freshman, but he's probably going to start on day 1. Between Peppers, Taylor and Countess, there's enough talent in there to keep the sidelines free and clear. The only question in the secondary, and really the biggest question-mark on the defense as a whole is safety. Who's going to replace Thomas Gordon? Jarrod Wilson is your other safety. So perhaps Delano Hill? He saw action in 2013 with varying levels of success. Would Countess/Taylor come over from corner? Probably not given their size. Perhaps an unproven younger guy like Clark, Lewis, Thomas or Stribling? Will be interesting to see this play out this spring. As is the case for most things Michigan football these days, it's tough to predict just how things are going to go. This group was exposed quite a bit towards the end of the season against good teams. But with good depth in many spots and key leaders returning, expect an overall improvement as a whole. Superstars? Jake Ryan leads that list. He's not a breakout star, mainly due to the fact that he's already broken out. But he could have a banner season. Willie Henry is possible breakout material. As is Ondre Pipkins. But right now it's safe to say that all eyes are on incoming freshman Jabrill Peppers. We may see some of him on offense as well. There's going to be runs at starting slots by a lot of guys this spring/summer. A hallmark of Greg Mattison is that he will sub frequently and change packages based on what the offense gives him. I can't even imagine what sort of jump statistically we might see in 2014, but in ideal situation would see Michigan finish this year with a top 20 overall defense. That may be enough to keep them in B1G title contention.